GâteauVélo: The Power of Strava. And Fudge. The Power of Strava. And Fudge. Yesterday I had a full VO2Max and blood lactate threshold test done at Winchester Uni, as part of a critical power research program I'm a lab rat for (full article to follow). It said my threshold for blood lactate is around 240W 226W. This is on a £35k SRM bike with a darned fancy blood analyser thingy and a blood sample being taken every 3 minutes as the power increased. Going back over my 'baseline' 1hr / 30km Strava segment that I do maybe twice a month, Strava has consistently pegged me at between 230 and 240W over the hour, over the last 6 months rides. It's a ride I do as fast as possible, and I've got a good feel now for how hard I can go initially on the flat without blowing up 40 minutes in on the hills. One correlation pointed out in the below article is that sticking to 65-75% of maimum heart rate is typically the lactate threshold (LT) that you can sit on pretty much all day. For these rides where I've logged 230-240W, my HR has hovered around 160, or around 85% of my Max HR. Noting that for this particular ride, Strava had it at 872KJ burnt, whereas the Suunto HRM said 768. I'd probably be inclined to believe the HRM over the Strava estimate based on a GPS track, as Strava can't account for wind, tyre pressure, bike aero-ness or weight, wheel efficiency etc. So if Suunto's energy consumed measurement is accurate, then you'd expect that real-world average power would be a bit less - maybe 10%. But if the HRM's 85% is accurate (which I believe it is), that one hour rate of work must be above my LT. (This is possible - I could try doing two laps and see if I can maintain the 30kph average. One for better weather methinks). UPDATE: James the PhD advised that on closer analysis of the lactate curve, the LT figure is more like 226W, not 240W. Which almost perfectly correlates with the Strava 1hr data. I doubt very much I'd be able to do another lap at that speed, so it's probably a shade over or right on my LT. So the lower HR average of 150 for day-long races would reflect the real LT of 226W. Hover just under that and go all day if you keep the flapjacks and water coming. So it looks like my above guess that 85% or 240W is indeed above my LT, and I'd be asking for cramped-up-in-a-ditch-vomiting trouble trying to sit on 85%. So Strava is most likely reading a bit under in terms of power / over in terms of KJ consumption, but close. And Suunto HRM's are pretty much spot on. Thinking more on this, these historic 1hr laps were done on a Cyclocross bike with around 80PSI knobbly CX tyres on - certainly a world away from 115PSI road slicks, and no doubt not what your average Strava-ite would be seen dead wearing. Having just fitted some decent slick rubber I should get out there and start collecting some new data, I'd expect Strava to come more into line with reality, all things considered. Clearly there's a ton of fudge involved comparing all these various fruits. But overall, for a *free* app that only needs a phone, Strava is pretty good at power estimation. 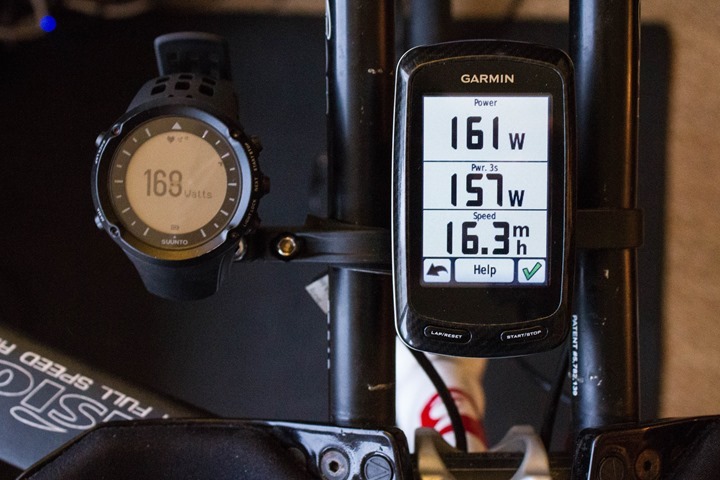 This is potentially invaluable info, and if I had a HRM that could show accurate average power (or a correlating metric) I'd definitely use it on long rides to ensure I was staying away from The Wall. Maybe I'll continue to stick with aiming for an 80% average HR. Or maybe I need one of these. No, dammit, I definitely need one. Question is, which kidney to sell? Here's an excellent, reasonably-understandable article on Glycogen, Glucose and Lactic Acid, and how they relate. While it's running-centric, the same mechanisms apply. I was surprised to read that 'Hitting The Wall' isn't a lack of Glycogen in the muscle, rather the effects of the buildup of Lactic Acid . I was also surprised that after 1hr of running your body gets 3 times the energy from burning fat as from muscle glycogen or blood Glucose. Those long, slow miles really are the best for loosing fat. "Above the anaerobic threshold, the volume of carbon dioxide production exceeds the volume of oxygen consumption. The removal of carbon dioxide (through exhalation) can no longer maintain blood acidity within reasonable limits. The rapidly rising hydrogen ion concentration and falling blood pH cause the fatigue and cramping we know as the Wall. Labored breathing is a sure sign of this process, and therefore monitoring it will help you determine how close you are to the threshold. For average marathoners, running at about 65% but perhaps up to 75 % of your maximal heart rate will keep you just below the threshold. This is how you avoid hitting the Wall."